This St. Patrick’s Day marked the arrival of the very first Southwest Hawaii inaugural flight. It landed at HNL just after 2pm and Beat of Hawaii decided to venture over from Kauai to meet the plane and check out the digs. After all, we started writing about Southwest Hawaii in April 2008! We are sharing our own photos with you together with many first look observations. First, on Saturday there was another round of Southwest Hawaii deals with $99 fares each way this spring. On checking again just now, there are still a few dates available in May. Today’s flight #6808 was from Oakland, and the 5 hour and 43 minute flight departed the West Coast at 11:26 PST. Tomorrow’s return carries the uniquely appropriate #808. On arrival today, guests received a traditional lei greeting and a Hawaii gift bag. We spoke with some of the deplaning passengers and heard a lot of excitement and enthusiasm about the flight, the service, and being in Hawaii. Special in-flight entertainment on today’s inaugural flight included hula dancers who performed live on the plane across the Pacific. We were told there was also free live TV and messaging, and $8 all you can use Wi-Fi. 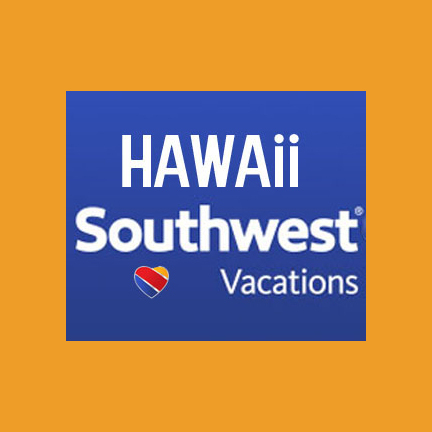 In the near future we plan to try flying Southwest, when the carrier begins flights to and from Kauai, and will provided a detailed trip report. We’ll also share more information on additional flights very soon, so be sure to subscribe to our updates and not miss out. 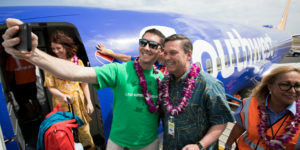 On hand was Hawaii Governor David Ige, president of Southwest Airlines, Tom Nealon, Exec. VP Andrew Watterson, and many other executives, plus, by our observation, perhaps a hundred or more Southwest employees from both mainland and Hawaii locations. To say it was celebratory and emotional was an understatement. This event had been some 10 years in planning, and Tom Nealon told the audience that he cried when he saw the plane arrive. Tom noted that CEO Gary Kelly recently said “we are in this for good… we’re in this for the long run, we aren’t going anywhere, we’re here to compete, and we are here to offer unmatched value and a quality product.” He went on to say that in the next two months they will operate 28 daily flights to and from Hawaii, and that, folks, is just the beginning. 3. New terminal at Honolulu Airport. Today marked the unveiling of the new Southwest terminal at HNL and it is a stunner and the best by far at the airport. Built together with the Hawaii State DOT, the terminal includes new open design holding areas with charging stations, beautiful restrooms, escalators and elevators. There are some new dining choices. We saw a large new Starbucks, and a Kona Brewery, neither of which were open today. Hopefully more additions to follow. Among the niceties at the new terminal, you’ll find many charging stations located throughout the seating areas. Southwest is operating at ground level below United Airlines at the far side of the airport, at the opposite end from the inter-island terminal. They have gates G7 to G10 in the Diamond Head Concourse. The new Southwest ticket lobby is located in Terminal 2, Lobby 6, but we did not have time to check that out today. Hi we are excited to make our first trip to Hawaii at the end of Jan 2020. Planning on visiting Maui, Oahu and Kaui and flying from Detroit to LA (lax) to Hawaii. 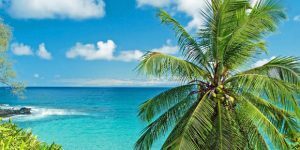 Do you recommend an order to visit the islands from a flight perspective like inter island connections, pricing etc? Plan on about 4 week visit if we can afford it. You’re in for a great trip. No, order doesn’t matter in terms of money or convenience. Just plan on enough time as it takes 1/2 day each time you change islands. 4 weeks sounds ideal. Look for best airfares typically three months before travel. Target price is in the $600’s RT plus inter-island. Aloha! Love your site. 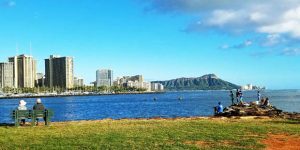 Any idea when mainland – Hawaii flights during the 2019 Christmas season will open up for flight booking on SW? How much for flights in November 1st week any deals or best routes from Florida to take to Honolulu change planes or long layovers? See you in November Hawaii cant wait. We plan to visit Kona in September. What connecting flights from Atlanta, GA will be available? What price for round trip for two senior citizens? Thanks. Currently $750 on multiple airlines but that should come down by about $200 during the summer. Southwest will not be offering one ticket service from Atlanta as far as we know. It’s not a new terminal. The Southwest gates are an extension of the Diamond Head Concourse, Gates G7-G9. HDOT converted 2 parking spots to accommodate up to 3 SWA 737s. It’s a further walk than from a United flight. Congratulations Southwest! I knew this day would com and am very excited for all the people who worked so hard to make it happen. I ❤️ SWA! Also, on another note – we are so relieved the MAX 8s are grounded until they figure out what is wrong. Been reading more about that and it doesn’t sound real good. Scary, even. Pilots with no control over what the plane does is just NOT good. Thanks again for keeping us posted on all things Hawaii!!! Thanks so much! It was fun to be there for the arrival and we look forward to trying their service when they start flying to and from Kauai. While by no means experts, we don’t think the Max aircraft will be gone long, or that there will be future problems once the control systems in question and training are corrected. Exactly where is the new terminal? Where the Commuter terminal was or somewhere else? Mahalo for all the updates! Am also a Kalaheo resident and receive all your emails. They are appreciated! Southwest is located underneath the United Airlines terminal. That is at the exact opposite end of the airport from the inter-island terminal. A long but pleasant walk or you can take the shuttle bus. 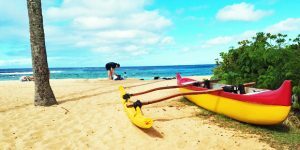 We are family of four (3 adults and one teenager), looking for our first trip to Hawaii Oahu from Tucson AZ in June, how to find best cheap airfare? Thank you an advance for your help. $523 on United with fast connection. Not sure it will improve – we’re doubtful. Thank you for the share on how the first Southwest flight was. It’s exciting! I’m looking for something from March 30- April 6 from either LAX, Long Beach or San Diego to HNL. Would love it as a long weekend so either weekend works. Any deals out there? No sorry there are no deals. Expect to pay from mid-$600’s RT for your peak of spring break dates. I’m just wondering if/when there will be any Southwest deals from the East Coast (specifically Boston) to Hawaii on Southwest. Sorry to say that will not be happening in the near future, at least on Southwest. Great news! Thank you for sharing the coverage! Do you have any thoughts on when the flights to Kauai might begin? Thanks again for all you do! That should happen within weeks, and we’ll write about it more soon. Please address how SWA-HNL will handle persons with mobility issues. I appears that with the Gates G7-G10 at ground level, entry and exit to the airplane will require the use of stairs or a ramp. A jet way does not seem possible for use. Thank You. That question is probably best taken up directly with their customer service. The aircraft are using a ramp gate, no stairs. Once inside the terminal, there are both elevators and escalators. How far is the new terminal from the baggage claim and the car rental desks?